Cacciola Iron Works is dedicated to providing our customers with the longest-lasting fences, railings, and other iron or aluminum pieces for your home. One elegant way to adorn your yard is with a beautiful iron arbor or pergola. Arbors can create an introduction to your backyard in a Victorian or modern manner, adding a gorgeous centerpiece that can shade you in the summer and even give vines and plants something to hold onto for natural privacy. Here’s how a custom-made pergola or arbor can be included in your garden’s design. Arbors and pergolas are often used interchangeably, but they do mean something a little different. Arbors are usually smaller entranceways made of vertical pillars and posts connected with lattices and supporting cross beams. They can also provide a covering for a bench or set of chairs. Pergolas, on the other hand, while often similar in design to arbors, are the larger of the two and usually cover a wider outdoor dining or living area. Arbors and pergolas can offer a relaxing amount of shade and match well with a finely trimmed garden. They have both practical and decorative uses that can really turn a yard into something special. 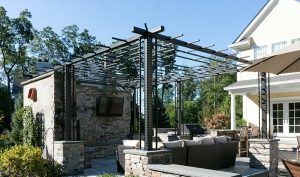 Cacciola Iron Works can take an existing structure like a patio or outdoor space and transform it by specially designing and installing an iron pergola or arbor that will last you and your family for years to come. With proper landscaping, you can add as much as 20 percent to the value of your home. They add a lot of beauty and interest to your outdoor area, giving you a valuable asset if you should ever sell your home. They make the perfect backdrop for family gatherings of all types, including weddings and anniversaries, outdoor parties, and more. They can provide a sense of privacy to an otherwise open yard through the use of shades and coverings. They can give you additional space for plants and greenery. Honeysuckle, ivy, wisteria, and grape vines make for a perfect natural ceiling as they intertwine themselves between the railing. You can rely on the masterful craftsmanship of Cacciola Iron Works to create unique and beautiful iron and aluminum railings, fencing, and custom pieces to make your home perfect. Contact us today for more information!